The footage of an enormous Great White shark circuling divers in a cage at Guadalupe Island was posted online in the last month and has since gone viral around the world. The footage was taken by Guadalupe Islands’ leading on site scientist Mauricio Hoyos and was actually shot back in November of 2013. During this month operators at the Island saw Deep Blue on just a few rare occasions. She was also filmed during that month by discovery channel for the acclaimed production “Jaws Strikes Back” in which she was tagged and followed by an underwater camera. 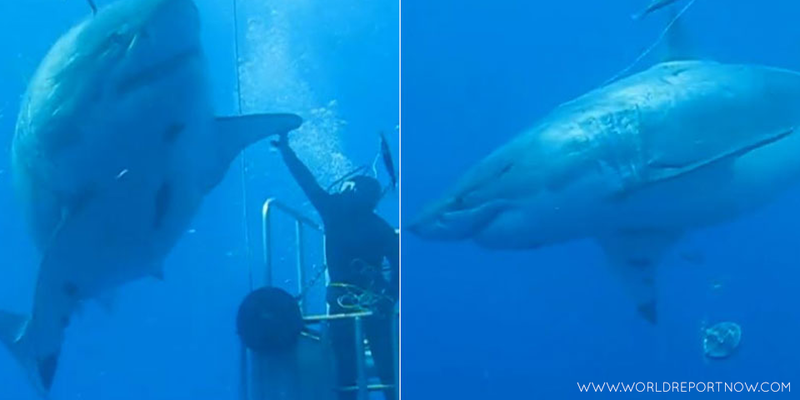 It is this Internet clip however, that really shows off her size and girth against the cage and the divers she encounters. Allegations have been made on the length of this shark but based on our knowledge and after speaking to Mauricio, Deep Blue has been estimated at anywhere between 19-21ft in length making her not only the largest sharks ever seen at Guadalupe but one of the largest ever seen on the planet! At over two tons in weight and possibly up to 50 years old this is a magnificent and rare specimen making the experience for the divers a true once in a lifetime wildlife encounter. It is theorised that Guadalupe is a mating ground for White sharks as from mid October onwards huge mature females are seen regularly, often with fresh mating scars down their flanks. They also coincide their arrival late in the season with that of the Californian Elephant seals of which they feed on to stock up on before making vast migrations along the Californian coastline. After a two-year migration, these females are seen time and time again revisiting the island and beginning the whole cycle once more. Seeing a shark like Deep Blue, in her natural environment from the safety of a cage is a truly humbling experience. She cannot be tamed, cannot be kept in captivity, weights the same as a small vehicle and is as long as a minibus. One of the worlds’ last unknown predators, unchanged for millions of years swimming effortlessly and majestically within touching distance of divers looking on in wonder.